Hey guys, so my Smittybilt X2O needs a new synthetic line. The one that came with it is fraying near the tab that bolts the line to the winch drum. I am looking for a decent affordable line, I dont use my winch that often but also dont want a cheapie line that wont last or will do the same thing. What are you all running for winch line? Do you like it? It may be possible. I've never tried, though I'm sure I'd need a new crimp on eyelet and a press. Splice a small eye, bolt and washer to trap it against the drum. Ive considered doing the same, only all the way around the drum. Aren't you supposed to leave more than that on the spool anyway? At least half of the spool should be covered when winching if not more!! There is a limiting choke thing available that stops you taking less than 8 or so wraps off the drum. I cant remember who sells it or how much it is. also, there is a company on ebay.co.uk that sells a line for like $120.00 with a hook. PM Sqwadoosh He has a link to a good winch line on budget. He also has experience with using this budget line. Just get a regular steel cable. I have not personally witnessed one fail. I have and will continue to run steel cable as well as every single person I wheel with.....just my opinion. The line on my drum is steel, and will likely always be.Steel cable just works better in Canada. It's well protected inside the bumper so if it's unspooled once a year and oiled keeps the rust off( Chain lube for dirt bikes works good), rewound back on the drum with a light load. Last winter the cable wraps were frozen together with ice. Light Propane torch insert through front of bumper and warm the cable. Can't do that with Syntactic rope. Was discussing synthetic vs steel with a seasoned wheeler and he mentioned sharp rocks and synthetic winch line can be dangerous. We have the synthetic on old red. The line on my drum is steel, and will likely always be.Steel cable just works better in Canada. It's well protected inside the bumper so if it's unspooled once a year and oiled keeps the rust off( Chain lube for dirt bikes works good), rewound back on the drum with a light load. Last winter the cable warps were frozen together with ice. Light Propane torch insert through front of bumper and warm the cable. Can't do that with Syntactic rope. I would avoid steel at all costs. We have the technology to do better and your safety isn't worth saving a couple bucks. My father-in-law was winching and had a steel cable snap on him. the recoil of the stored energy was so violent that it shot through the air 50 feet and struck him across the face knocking him unconscious. he was fortunate to have had a couple people with him to drive him to the hospital to get sewn up and CT scanned. Since we are on the subject... I've been reading that the experts recommend a roller fairlead even for synthetic line. There are polyurethane rollers available for standard Warn roller fairleads but I have always liked the low profile roller fairlead that is made by Smittybilt. So I got the low profile rollers from Daystar and modified them to fit the low profile roller fairlead. What do you think? Was there a dampener on the cable? If you don’t use the right equipment bad things can happen. I always carry a dampener on my recovery bag. You cant talk some guys out of steel rope. Syn is better and thats why its used heavily in industry too. People still act like syn rope is something new not to be trusted..... Ridiculous. Its nearly twice as strong and half the weight or less. There are chaff gaurds and this thing called sensible winching if you are worried. Without knowing the circumstances of the cable that snapped, it would be difficult to assume that under the same circumstances that a synthetic cable would NOT snap. In over 20+ of wheeling, and seeing dozens of winching situations, I have never witnessed a winch cable snap. All the winching that I did with my Ramsey 8000 was to some other vehicle. All of the winching I witnessed was done during a 4-wheeling club event or a sanctioned event by another club, so typically the “safety” requirements were monitored. However, I have seen some very careless winching being done. Regarding the cables, steel has worked for as many years as there have been winches. Synthetic cables may be highly advanced in their material, typically have a higher break strength ie. Warn’s Spydura Synthetic Rope or Dyneema. But… is there a head to head comparison, or data, in actual use under common 4x4 off-road winching? So… is Spydura or Dyneema more durable than steel cable? Cable or rope strength is important, but so is resistance to abrasion, UV decomposition, cutting, and weather conditions – ice and water. The sun and heat are big factors here in Arizona. The heat and sun are destructive to almost everything that is not metal. If I laid a coil of steel winch cable and a coil of Spydura synthetic winch rope out in direct Arizona sun and weather for 12 months, then tested them, which one would hold up in terms of just the environmental factor? There is ample evidence to show that if a winch cable breaks, the synthetic rope is safer and would be theoretically less dangerous than a steel cable. But… proper safety precautions would mitigate those dangers for the use of steel cable. One of my concerns is the ability to look at or examine a winch cable for possible defects, damage, kinks, or broken steel strands, or other wear. Can I physically and visually examine a synthetic winch rope for weak, defective, wear, or damage that could result in a break? With a steel cable it seems if there is wear or damage, the outer strands are usually broken and very visible. It would be nice to see an actual long term comparison between the steel cable vs. synthetic rope. I personally would not be overly concerned with the cost factor, my safety is not a discount item. I think the choice is like many aspects of our hobby… it depends. Not to say I don’t like some bling now and then, however…. my professional career is technical sales, product marketing, and advertising, so I believe there are lots and lots of the “stuff” that is available and marketed is more hype than an actual basic fundamental necessity. Was discussing synthetic vs steel with a seasoned wheeler and he mentioned sharp rocks and synthetic winch line can be dangerous. You are not supposed to let your steel cable run across rocks either. Was there a dampener on the cable? If you don’t use the right equipment bad things can happen. Outside of an organized event, I think I could count the number of times I have seen a damper used on one hand. With the way everyone seems to gather around a winching, mindlessly standing in the "danger zone", I am surprised more people haven't been killed by a broken line or a loose hook. A long term head-to-head comparison would only give you an outcome under controlled circumstances, the lifespan/success/failure of either in the real world is solely dependent on the human using it. I don't have any experience with synthetic line yet, but considering how UV effects it I would imagine that location would have a lot to do with how it lasts. It probably would last a lot longer up here in Alaska than down in the south west. From what I gather, synthetic rope is good for about 10yrs of UV exposure, but a cover would eliminate the effects of UV, rain, mud, snow, dust, etc., when not in use. Watching the winch cable and rope failures on youtube, the failures all appear to be caused by human error in how and what the users are expecting their winch to do, i.e., either pull vehicle out of a situation where the axles are burried, at angles, or where the weight of the vehicle is well below the winch. You are not supposed to flip over either. I have seen, not many times, a winch cable being pulled on rocks. In all the winchings I can remember, someone threw a blanket, a big coat, a tarp, or something on the winch cable. I have seen people stand in areas they should not be. Safety was always a topic in our 4-wheel clubs and usually performed, but not always. How do think they test the cables? The fact that the synthetic is being touted as better than steel has nothing to do with the human using it. I believe the number of times a winch cable has snapped is very rare. BUT… I have seen many many dumb-a$$ drivers take a stupid line, or worse, a dumb-a$$ spotter guide a vehicle into carnage. In any given trail run I’ve been on, the very least thing I was ever concerned about regarding ANY safety or dangerous situations, was a winch cable snapping. In my experience the number of injuries from someone slipping and falling on a rock is a magnitude greater than being injured from a winch cable snapping. In any given trail run I’ve been on, the very least thing I was ever concerned about regarding ANY safety or dangerous situations, was a winch cable snapping. I'm pretty sure it has less to do with the winch line itself snapping, and more so a loose hook (as Snowtoy said) or something like an unrated shackle or poorly attached tow point. I buy long lengths of line and make my own stuff. I made an 80 foot winch line, a 50 foot extension, and a 100 foot extension. Splice in your own loops and save big money. For UV exposure maybe, but ice can cut just as good as sand. Standard practice to thaw winch cables on equipment has always been to heat it with a large propane torch. With a 34,000 BTU torch it would not take much to destroy a synthetic rope. How do think they test the cables? In a lab, under a strength test. I Would lay odds, that unlike synthetic rope, Warn nor any other winch company did any kind of long term testing of steel cables, why would they, the only issue with steel is the amount of force it will handle before breaking. The fact that the synthetic is being touted as better than steel has nothing to do with the human using it. It is when it comes to strength, weight, and safety, its only actual issue is being drug over sharp rocks, which is also an issue for steel, only steel put up with more of it, before it breaks. The only real issue with synthetic is having to clean it after use, just as you are supposed to do with your recovery strap, and really what you are supposed to do with your steel cable, which most don't do, just like they don't unspool-respool after each use. 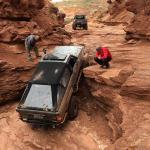 Of course, on any given run there are usually more people running around the rocks than number of times a winch is used, yet unlike a whipping winch line, flying d-ring, tow hook, bumper, or winch, most slip and falls don't usually have a high probability of severe injury or death. If I could go back in time, when I was actively 4-wheeling, I would not buy a winch. My Ramsey 8,000 was a gift from Ramsey. There are several reasons why I would not buy one. The 6 or 7 times I actually used it was to winch some other vehicle. 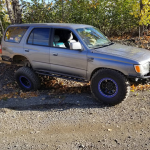 2 - it added noticeable weight to my 1986 IFS truck, 3 - There was almost always someone on the run that had a winch and was always anxious and ready to use it. 4 - I wasn't interested in the trails where winching up a vertical waterfall was part of an adrenalin pumping macho thing. If I were to buy a winch for a real potential need, it would be Warn M8274-70 with STEEL cable, with a dual receiver removable mount - probably a customized mount. You can buy a small polyurethane thimble that goes on synthetic line behind the hook and stays there, saves having to remember to throw a coat. It also stops the hook driving through the fairlead on retraction. Winch blankets are a PITA. especially if its muddy. Synthetic line should be washed to remove abrasive particles, as should kinetic recovery ropes and the like. Can be done in the washing machine. The common Aluminium fairlead is more than adequate, or even polished stainless, anything smooth and shiny. Yes the aluminium wears but hey when a fairlead is sub 30 dollhairs does it really matter. I can see problems occuring with a poly roller fairlead. If i was to buy a NEW winch, Gigglepin. twice the winch of an 8274 in every way, yet the same money. I would not buy a new 8274 i would acquire an old one and modify it with useful stuff like a better motor (not that there is anything with a 9.5xp motor they are just so overpriced) and a wider drum to hold more synthetic rope. synthetic can also be easily field spliced and can be ran through your hand while setting up without the fear of a thousand stab wounds to your hands. I have known it burn skin but you need serious FPM for that. You can also tie knots in it as well as splice it. You can keep another 100ft bundled in the back of the truck with a loop either end and use it as an extension, choke, loop, rope swing, speeder bike trap, string deer up with it. The uses are nearly endless. Also i cant stress enough that you carry a strop (strap with a loop at either end) and/or an endless sling at 5tons 8ft EWL. Needed for winching from trees, moving rocks, moving logs etc. Looped through themselves they will grip onto most surfaces, clamp and pull. Other things to consider are a stump hook, ground anchor (like a pull pall but manly), attachments for your highlift to use it as a winch, waffle boards/bridging ladders, shovel, toilet paper, gloves, eye pro.